Like I've mentioned in past Retro Reviews of Spider-Man and The X-Men (other characters I'm not really a fan of), most of my knowledge of the FF has been gained by comic fan osmosis. I have a few issues of various runs lurking in the Longboxes and they've crossed over into other series I've read, but I've never gone out of my way to buy a single issue of Fantastic Four, except for the issue at hand and issue #51. . .which I bought purely for their covers. The few other issues of FF that I own have sort of fallen into my collection by accident. . .being part of auction lots, comic bundles, and so on. So what I'm saying is that I'm familiar with the FF, but am by no means a fan. That said, this is only one of two issues I have written by the FF's original writer, Stan Lee, so I'm perfectly willing to give it an honest read and try to let Stan The Man change my mind. I have ANOTHER confession to make before we get into this issue. . .I'm not really a fan of Jack Kirby's art. Please don't hurt me. If you've read some of the other "Retro Reviews" I've done, you've seen me TRY to like Kirby's art. Unfortunately, I don't have a large selection of his work in my collection and what I do have isn't BAD, but I find it sort of "Meh" and somewhat overrated in my extremely humble opinion. That said, I'm willing to give it another chance because number one, I DO love that cover and number two, it's some of Kirby's earlier work, and all I've seen before is from the 70's, where I've read he was on a bit of a decline. So two strikes against this comic before I even open the cover on it, but I think I can still give it a fair shake. . .so let's do this! Not from my copy. My scanner is down, so I pulled the art for this review from online. I WISH the colors on mine were this bright. A little background: I bought this comic book for its great cover back in January from an antique store (really more of a junk shop) where it was in a battered and partly burned CGC slab rated 6.5 for the oddly low price of $100. A pretty good find, I'd say. For the comic collecting purists and slab haters out there reading this, I'm sure you'll be pleased to hear that for this review, I cracked that charred and partly melted slab open and freed this old comic from its plastic prison for a proper reading for the first time in God knows how long (and to make it easier to frame on my office wall). So I bought this book for the cover, let's talk about the cover. . .that glorious, MAGNIFICIENT cover! 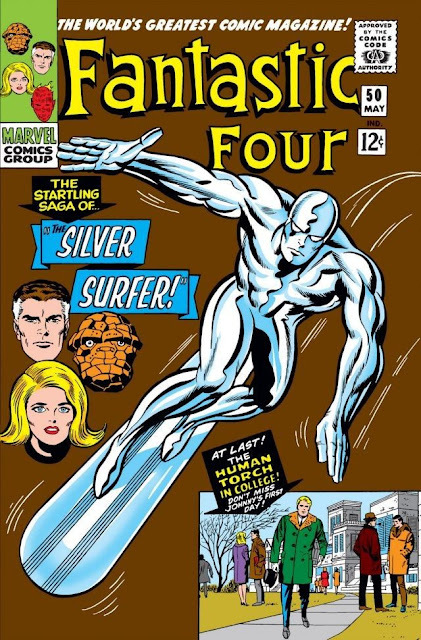 Like I said above, I'm not really a fan of Kirby's art, but the stark figure of Silver Surfer on that unusual creamy brown background with the floating heads of 3 of the Fantastic Four and the yellow letters of the title combine to make this cover a real eye catcher. I don't think I've ever seen another cover like this. I think it's the matte brown background that makes it so intriguing. . .I'm not sure if that color has ever been used in that way since. One would think a plain brown background would be dull and uninteresting, but it REALLY makes the other elements pop in a big way. If I have one complaint it's the whole "Human Torch Goes To College" thing taking up most of the real estate down in the right bottom corner. I could do without that part, but even that's pretty well done, even though it seems a bit intrusive and unnecessary. Other than that, this comic definitely has one of my favorite covers in my entire collection. So that's the cover. Let's get into what's underneath. Right off the bat, I realize that, unlike most of the comics of this era that I've read, this isn't a "one and done", but part of a story continued from the previous issue. A trip to the Wikipedia Knowledge Well let me know that this is actually the conclusion of a 3 issue story arc introducing Silver Surfer and Galactus, and that Lee and Kirby's extended story arcs such as this one were considered a bit of a revolution in comic storytelling at the time. Unfortunately, I have the NEXT issue but neither of the previous issues, so I was sort of dropped into the middle of things. Thankfully, the storytelling isn't nearly as decompressed as modern comics, so the splash page sums things up nicely. I'll just drop it in here for you. . . I have to admit, the splash didn't impress me much. It's a little crowded and Galactus has plenty of bluster, but it's hard to pull off being threatening when you're wearing purple. Probably why Hawkeye hardly ever wears his superhero suit these days and The Phantom is practically forgotten. . .BUT I DIGRESS! Galactus has pretty much shown the Fantastic Four that they are powerless against him, but Silver Surfer has been convinced by Ben Grimm's girlfriend (Alicia Masters) that mankind are worth saving. The Surfer confronts his master and pleads with him to spare Earth, but (as The Watcher points out) how can Galactus be convinced when what he is doing is not evil, but simply Galactus' way of survival? And so an epic battle between Galactus and Silver Surfer begins. At first, The Surfer surprises Galactus with his power and seems to be getting the upper hand, but Galactus was just holding back, hoping to convince his herald and longtime companion that humans are just another energy source and that Silver Surfer needs to come to his senses and return to his proper place as Galactus' herald. During the battle The Thing, Mr. Fantastic, and Invisible Girl can only watch helplessly. Meanwhile, Johnny Storm is travelling through other dimensions to a far away part of the universe under the guidance of The Watcher in order to retrieve the only thing that has a chance to deter Galactus. . .a device known as THE ULTIMATE MAGUFFIN. . .er. . .THE ULTIMATE NULLIFIER! A device so powerful that it can destroy an entire galaxy. . .possibly an entire universe. When confronted by the Ultimate Nullifier in the hands of Mr. Fantastic, Galactus immediately realizes that it is the doing of The Watcher that the humans have come into possession of such a deadly device. Under pressure from Mr. Fantastic waving the Nullifier and threatening to destroy everything, The Watcher demanding that Galactus recognize the infancy of a possibly great race being destroyed when there's plenty of other planets in the galaxy, and the Silver Surfer ready to fight to the death to protect humankind, Galactus decides it's not worth the trouble and leaves Earth. But before departing, Galactus strips The Silver Surfer of his title of Herald and his Space-Time travelling powers, stranding him on Earth with the humans he fought so hard to protect. With him, The Watcher also departs and the world is saved from a devastating fate. WAIT! This comic is only HALFWAY DONE! That's right. 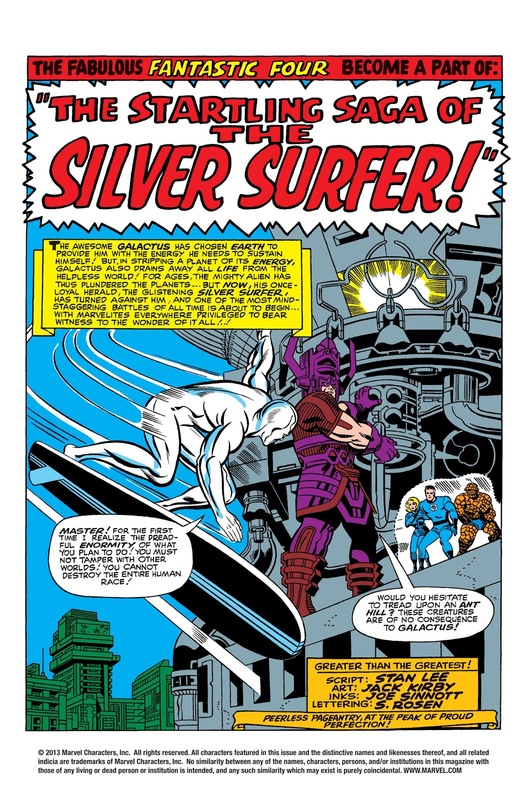 The entire epic battle between Silver Surfer and Galactus, Johnny Storm's trip through time and space to retrieve the Ultimate Nullifier, and Galactus folding under pressure from the Surfer, Watcher, and Fantastic Four, then stripping the Surfer of power and stranding him on Earth before leaving humankind to their own fate only took up TEN PAGES! These days, all that would take TEN ISSUES. After Galactus' departure, Ben (The Thing) Grimm notices his girlfriend (Alicia Masters) showing a lot of attention to the now-stranded Silver Surfer. He gets the wrong idea and gets surly, shuffling off and feeling like a loser without hearing The Surfer blow Alicia off in favor of exploring his new home planet. A mysterious bald man is setting himself up as the Fantastic Four's next villain as he obsesses over the news coverage of their defeat of Galactus (Even though 3 out of four of them just sort of stood around in a force field and watched during the whole battle). We get a page of football team drama at Metro College as the hotshot player Whitey Mullins lets his coach know what an old has-been he is and how the team would be nothing without Mullins as the star, and the coach's wife trying to make him feel better. The scene shifts to the Fantastic Four's headquarters (The Baxter Building), where Reed Richards is ignoring his wife as he sinks deep into his experiments (He's desperately trying to find a way to protect Earth from future attacks by beings such as Galactus. . .but that's not really explained until next issue). Sue can't appreciate his scientific genius and need to be alone at the moment to do some work because she's being a bit of a needy b*tch. But can you blame her? The goddamn world was just about drained of energy by a giant guy from outer space! A girl MIGHT need some extra attention after almost being exterminated. Ben Grimm wanders the streets of New York, still feeling surly about his girlfriend paying some attention to the Silver Surfer after he. . .well. . .saved the entire world while Ben stood watching in a force field. He scares a random woman and punches a wall because I guess that's how you got your girlfriend to pay more attention to you in 1966. As promised on the cover. . .It's The Human Torch's first day of college! 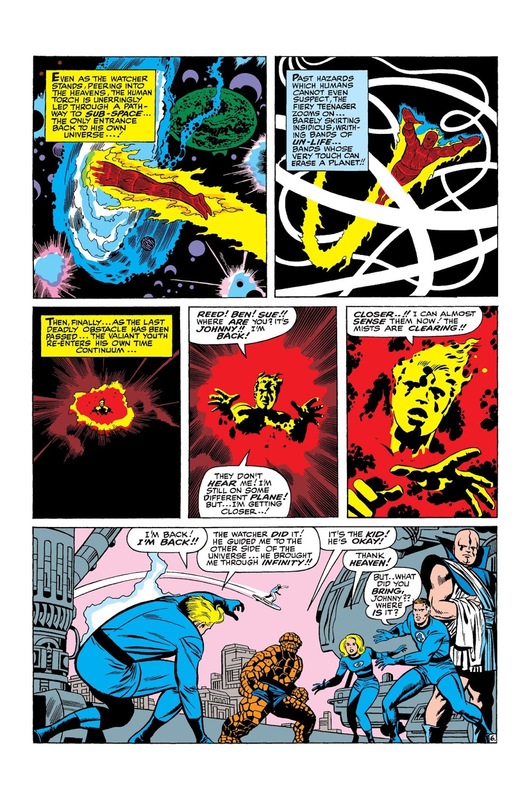 Johnny Storm seems none the worse for wear after travelling to the ends of the universe and back to retrieve a super-weapon capable of destroying everything and everyone, and his realizing that humankind are completely insignificant in the bigger scope of the infinite cosmos in the process. But hey. . .College! We follow Johnny as he meets his new roomie (Wyatt Wingfoot), talks to the dean, worries about being able to make it in college, and pines over his Inhuman girlfriend trapped under an impenetrable dome at the edge of the world. I joke a bit, but really I like that the epic conclusion to the Galactus/Silver Surfer saga. . .the greatest threat mankind has ever faced and the moment when the mighty Fantastic Four realizes that there are things in the universe that they are utterly powerless against takes only half of the issue, and then the rest of the comic is like, "Well, THAT happened. . .but life goes on." And that's another thing I liked a lot about this issue. . .that the Fantastic Four really didn't do that much because there really wasn't anything they COULD do. Even Johnny Storm's trip to get the Infinite Nullifier was under the power and guidance of The Watcher. He really didn't have anything to do with it beside provide a body. This was a REALLY unusual story in that the titular heroes didn't really win the day at all. Galactus just left because he was convinced that Earth wasn't worth his trouble. It's fairly common these days that the heroes don't always win, but I don't think that was the case in 1966. Most of the time (Especially in the DC comics I have from that era), the problem is solved in one issue and the status quo never changes. I'm fortunate to have the next issue where I can see the repercussions of this story. . .with Reed Richard's obsession with protecting Earth from future attacks by beings like Galactus almost leading to his death. I don't mean to discuss another issue, but it's almost like Richards has PTSD from the events in this comic. It's really a dark place to go with the bright and bombastic heroes of the Silver Age, to show them as powerless against an enemy and then to show that feeling of powerlessness as a continuing story element. Overall, even though I don't have all three issues of this story, I found myself enjoying it a LOT more than I ever thought I would. I said at the beginning of this review that I was willing to let Stan The Man change my mind about The Fantastic Four and I have to say that this issue might have done just that. That said, It's not a perfect comic by any means. . .I haven't found one yet. The Ultimate Nullifier seems like a textbook example of "Deus Ex Machina", and some of the college scenes were pretty weak compared to the philosophical debates in the front half over whether or not something has the right to exist, even though it is of no significance to a more powerful being. But the weak points don't take away from the fact that this comic is a genuinely entertaining piece of work that holds up well to a modern reading. As far as the art goes. . .
At the beginning of this, I confessed that I'm not really a Kirby fan, based on what I've seen from him previously, which (to be fair) was some of his later work. I was perfectly willing to give his art a fair shake in this comic and I have to say that now I can see why Kirby is regarded as a legend in many comic collector circles. I'm not going to go so far as to say he's my new favorite artist. . .as far as I'm concerned, Kubert still has him beat hands down. . .but I WILL say that I'm a lot more impressed with his earlier work than I was prepared to be. I was especially liking his portrayal of The Thing. I think maybe the inker had a big hand in it, but the rocky texture of The Thing stood out in a big way, with an almost three-dimensional look that some artists on today's comics can't even come close to. 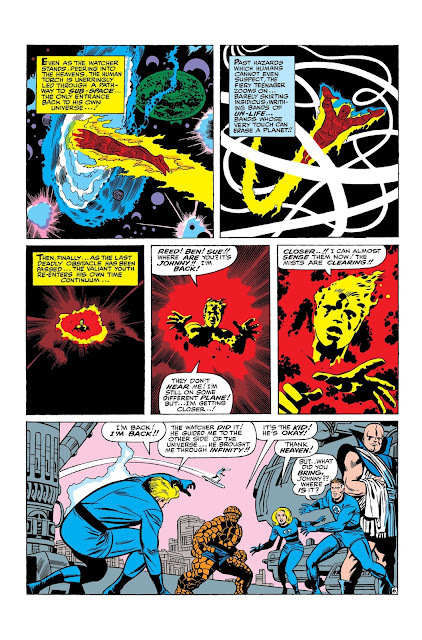 The scenes of Johnny Storm in outer space were also fantastic, with a beautiful and psychedelic style that really catches the eye and invites you to linger over the panels for a while. Overall, I was very pleasantly surprised to find myself FINALLY finding some Kirby artwork that made me understand why people still regard him as "King" Kirby. I started doing these "Retro Reviews" in order to more familiarize myself with the older comics in my collection. I admit that I bought a lot of them just because I thought the covers would look nice as part of my rotating comic art collection on my office wall and I never read most of them beyond a quick flip through. That's exactly the case with Fantastic Four #50. Because I'm not a fan of the characters, I bought it for the cover and was more than happy to let it sit unread until it was time to take a turn up on the wall in a frame. . .then after a while, back into the Longbox. But I have to say that it would have been a mistake to have never taken the time to read this comic. Sure, it has an outstanding cover and will take a proud place on the office wall for a while, like I intended when I bought it. . .but underneath that cover, I discovered a genuinely entertaining story that really makes me want to read the other two parts of it. . .and then KEEP reading after that! For someone who has never been a fan of The Fantastic Four, that's something. It's not the best comic I've ever read, but it was surprisingly good and managed to break through my pre-conceived notions of what I was going to get from a Silver Age comic. Back to Longbox Junk Business as usual with more Merry Marvel Mainstream Madness courtesy of my comic collectin' daughter. Great review, and I appreciate the humor (punching the wall never seems to work out very well for anyone except for "Drywall Man," the hero we all need in our lives on occasion). I've always been back and forth on the FF, depending upon who was at the controls at the time. I'm reading the new series and enjoying it so far after four issues. Thanks for sharing your incite with us!